There are few things more rewarding—or therapeutic—as growing your own chile peppers. This guide outlines the methods we use to grow chiles from seeds. Even if you are new to gardening, you’ll be able to grow your own chiles by following these steps. We have divided this into three sections: Seed Starting for those who want to start at the very beginning, Growing Method for those who have purchased small plants and seedlings, and a Recommend Solutions section for products and resources we have found to be helpful. 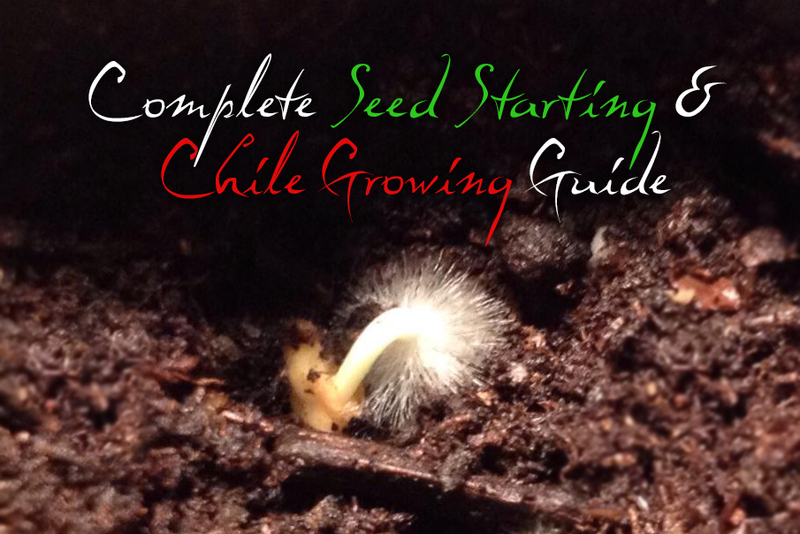 Many people struggle with growing chile plants because they cannot get their seeds to germinate. Some of the hottest varities—especially “superhots” like bhut jolokia, moruga scorpion, and the famous Carolina Reaper seem to be the hardest for beginners to grow, as the seeds sometimes take up to 60 days to germinate. Although these instructions are a bit lengthy, we hope that they will help you avoid common pitfalls and answer the questions you might have. Put your seeds in the refrigerator for a few days (not the freezer) to mimic the environment of winter dormancy. (Optional) Make some black tea and chill it. Place your seeds in the tea and let them soak for 30 minutes or more (not more than 8 hours). There are tannins in the black tea that help to make the seed casing softer and easier to sprout. We also make some chamomile tea, chill it, and mix it with the black tea, and let the seeds soak in that tea mixture. The chamomile tea also has properties that help defeat a fungal disease in young seedlings called damping off. Plant the seeds in moist seed starting soil or moist Jiffy Pods. They don’t need to be buried deep at all! We just barely cover them with soil by using a toothpick to drag some grains of soil/peat moss across them. Keep the soil/pods moist—not soaked and not dried out. This is maybe the trickiest part. Using a spray bottle to “mist” the soil can work better than trying to pour water on them. Keep the soil/pods warm. You already chilled the seeds to mimic winter, and now you want to provide an artificial spring/summer “wake up” signal. (This is especially important if you live in colder climate.) There are two ways to accomplish this. First, you can purchase a heat mat so place under your soil (we like this one). You can also place your seeds and soil on top of any appliance in your home that generates heat. If you touch the top of the appliance and it feels warm, it will work! If you cannot provide a heat source, your seeds may still grow, but it could take much longer. Once the seeds start growing and are starting to stand up, get as much light on them as possible. If they do not have adequate light, they will “search” for light and start to grow very tall (or “leggy”). If they get tall too soon, it becomes a problem later. The plant will become top-heavy, susceptible to wind damage, and less sturdy to support many chile pods. To give your plants light, you can either choose to put them under light bulbs or near a sunny window (as long as the window doesn’t have extreme hot or cold temperatures). If you use bulbs, you will want the bulbs very close to the plants, perhaps 2-3 inches above them (just not so close that they plants are scorched). You do NOT need professional growing lights. If you can afford them, wonderful. But if not, you can just use standard light bulbs. When your seedlings first start growing, they will emerge with two little green leaf-like parts called “cotyledons.” These provide food for the plant as it emerges, but they will eventually fall off. We don’t recommend transplanting them into larger containers or the ground until they develop two or three more sets of true leaves. If you have started you own seeds, continue with them as follows. If you have purchased seedlings or small plants, this is where you’ll want to start. Transplant your small plants into a larger container with a real soil/potting mix. We can not overemphasize this enough! Many chile plants die because they are transplanted into soil that is simply not good for growing in. We make some recommendations below about soils/potting mixes. The larger the container you use, the larger the plant can get. We recommend a five gallon pot for each plant, and not smaller than a 1 gallon pot. Your plants will need to be watered, but be very careful not to give them too much! Compared to a lot of other plants, chile plants prefer less water. Only water them when you pick up the plant and you can feel that is lightweight from lack of water. Aim for soil that is moist, not drenched. Depending on the temperatures and hours of sunlight, you may only need to water once a week. Help the plants grow stronger stems by gently running your hands across the leaves everyday. You may also choose to let a fan blow gently on them for a little while each day. This “workout” will help them be able to withstand wind outdoors. If you started growing your plants indoors, they will need to go through a process called “hardening off” before you put them outside. Plants that begin indoors often are too weak to face the elements. To help them get used to being outside, place them outside in the sunlight for just an hour for several days. Then put them outside for two hours, gradually increasing the amount of time each day. This will help them get used to the intense light of the sun slowly, as well as any wind. Don’t put your plants permanently outside until you are past the last date of frost in your area (you can find this information online or from any local nursery). You can put your plants out in the daytime, but be sure to bring them indoors at night. Chile plants are rather sensitive to the cold. After growing for approximately 1-3 months (regardless of plant height), your plant will start to grow little flowers. These will eventually to turn into chile pepper fruits (commonly called “pods”). However, we recommend pinching/cutting off the first flowers. This will help your plant focus on growing larger and ultimately grow even more flowers/pods later. Once you are ready to transplant your chile plants, we highly recommend using the correct growing medium, which would be either be soil in your garden or some sort of potting mix for growing in a container. Soil is very complex, and achieving the proper pH, density, and nutrients, can be quite difficult to achieve for beginners. So we recommend getting a growing medium already prepared by professionals. If you will be growing in containers or pots, we highly recommend products by FoxFarms. It is all incredible. We personally love the Ocean Forest potting mix, and others love their Happy Frog or Light Warrior mixes as well. If you are growing a larger, traditional garden or very large numbers of plants pots, it may not be financially practical to use bagged mixes like FoxFarms. That is the case for us. We recommend contacting your local plant nursery. Many nurseries have bulk soil and potting mixes that are sold by the truck load—and some nurseries will even deliver it to you. Nurseries know what they are doing, so this can also be a great resource to get high quality soil for your plants. Finally, if you choose to use fertilizer for your plants, we once again would recommend products by FoxFarms. We like their Happy Frog Tomato & Vegetable fertilizer. We hope that you find these tips to be helpful! Feel free to contact us and ask questions below!